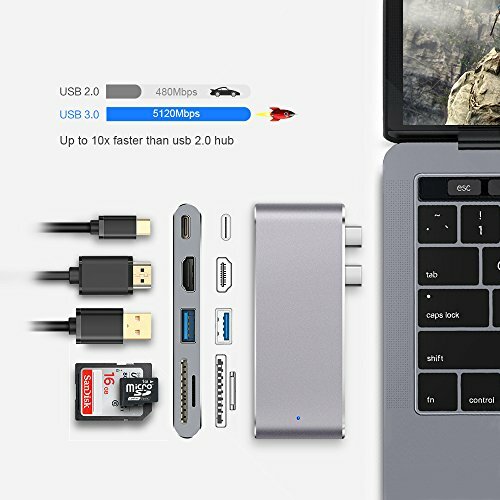 Opluz 5 in 1 Type-C hub adapter provide multi-function ways for you to expand your macbook with high speed 3.0 USB infomation transmission, 4k@30Hz HDMI clearly viewing, various of card reading and Type-C power supply. -Macbook Pro 13inch/ Macbook Pro 15 inch. Multi-function Type-C Hub Adapter --- 2xType-C for Macbook Port + 1xType-C + 1x4K HDMI + 1xUSB3.0 + 1xSD Slot+ 1xMicro SD Slot Hub Adapter. Aluminum Material & Designed for Type-C MacBook --- Including 2016/ 2017 Apple MacBook Pro 13/15 inch, 2016 (2015) New MacBook 12 inch. Stable Fast Transmission Speed --- USB PHY technology, keep the interface running at full speed in different topology channels, maintaining signal integrity, and the Ports does not interfere with each other. Application Range&4K High Definition --- Read micro SD/ SD card, charge your cell phone, contact projector with HDMI, read your SSD. You can enjoy with 4K(3840*2106)@30Hz clearly picture with HDMI Video Converter. If you have any questions about this product by Opluz, contact us by completing and submitting the form below. If you are looking for a specif part number, please include it with your message.